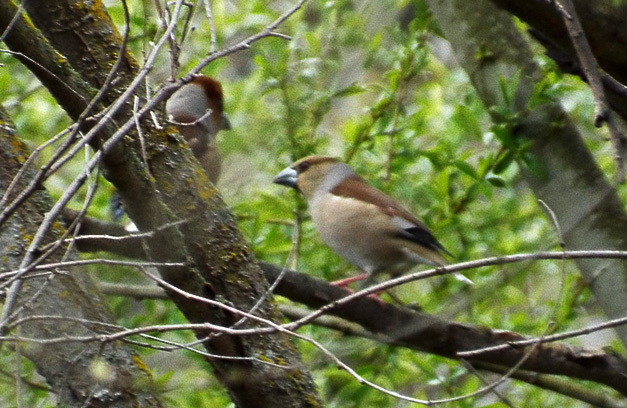 Hawfinches are simultaniously by far the biggest finch, and, strangely, the hardest to locate of all the species in the UK. Theoretically, they are very widespread, but they are very secretive and generally will hide from humans long before you know they are there. They are more easily seen in the Winter when leaves are off the trees, but even then it's probably easiest to go see one that has been reported as being around for a while like my first bird at Rutland Water. On the Continent they are far more common, and I came across this pair along the river at El Pardo entirely by coincidence - something that in the UK would be a massive highlight of the day.